For our anniversary dinner this year, Marcus and I wanted to do something a little more casual than we've done in the past. Normally we do two dinners (one here and one elsewhere), so we decided to combine the two traditions into one -- taking a trip to DC over our anniversary weekend with a casual dinner on the actual night. 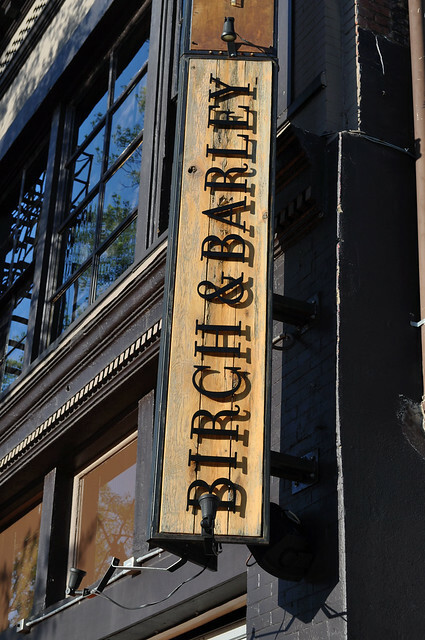 With recommendations from Bon Appetit and various travel magazines, we thought Birch & Barley would be a great fit for our celebration. Located near Logan Circle, Birch & Barley is a restaurant "dedicated to an unparalleled collection of 555 artisanal beers (500 bottled beers, 50 drafts, and five cask ales), delivering a completely unique food and beer experience by celebrating a full spectrum of styles, traditions, regions, and flavors" with "awesome upscale comfort food" by Chef Kyle Bailey. A graduate of the Culinary Institute of American in Hyde Park, Chef Bailey began his training in luxury resorts in the Caribbean and Florida as well as several notable New York City destinations before he found his home in DC. In New York City, he worked under Chef Shea Gallante at the now-shuttered Cru, where the wine-focused bar and restaurant helped Chef Bailey "develop a deep understand of the art of food and beverage pairings." After his stint at Cru, he moved onto work for Chef Dan Barber at Blue Hill at Stone Barns in Tarrytown, where he really embraced the true practice of farm-to-table as well as "explored the new world of food and craft beer pairings." 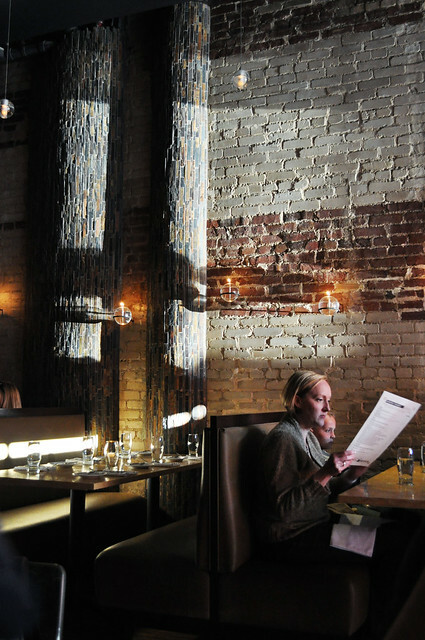 He moved onto Allen & Delancey in 2008, where he assumed his first executive chef position. This was his first opportunity to pair his food with cocktails which "helped round out his expertise with food and beverage pairings." A few years later, he set up shop in DC at Birch & Barley as well as ChurchKey, both restaurants melding "his farm-to-table approach with a beer-forward menu." You can tell the restaurant's commitment to being "farm-to-table" as the menu is printed fresh daily, dictated by the availability of ingredients that day. I also love that I could get a shot of this with the date of our anniversary! Gotta love exposed brick inside a restaurant like this one, as it's well mixed with some modern nuances of the gaslit orbs along the wall. 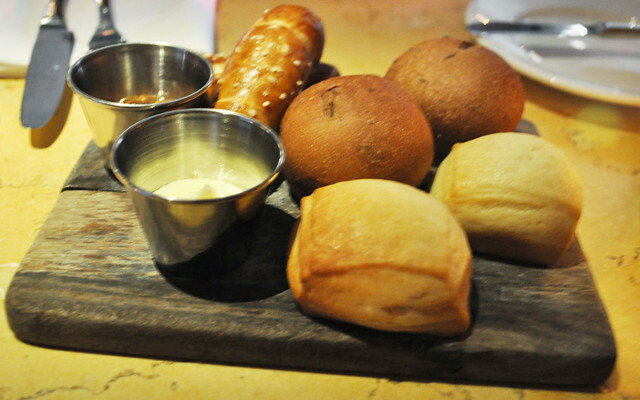 Dinner began with a fabulous assortment of warm bread -- three varieties including pretzel, pumpernickel, and crème fraîche. All distinctly different in flavor but all satisfying our tickle of hunger as we were deciding what to order. The pretzel bread was the right amount of salt and dough; the pumpernickel was lovely; and the crème fraîche had the softest and creamiest center. Needless to say, we devoured the board in its entirety. First nibbles for us included the Butcher's Board with fresh and cured charcuterie made in house and served with mustard, toast, and cornichons. The charcuterie included lardo (yup, pure and unadulterated pork fat! 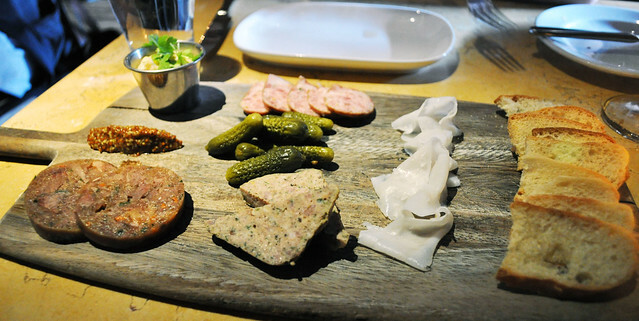 ), kielbasa (or some kind of sausage), chicken liver mousse, pâté de campagne, and intestine. You could definitely tell that it was all made in house (super fresh!). It was a little more on the adventurous side for me as charcuterie, but I appreciated the delicate meticulousness that went into preparing it all. As my first course, I had the pan-seared sweetbreads with poached rhubarb, hazelnut butter, frisée, elderflower, and watercress. 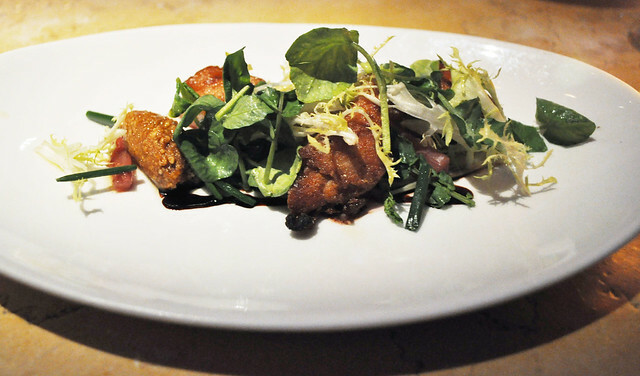 Sweetbreads isn't too complex of an ingredient, but the caveat with them that they're mostly all texture -- the flavor comes from the preparation, making it the key to making them tasty. Many times, even after frying them, the accompanying condiments and ingredients don't add much to the sweetbreads, resulting in the predicament you wished to avoid at the getgo -- just fried texture and nothing else. Fortunately, Chef Bailey knows how to work magic into these sweetbreads, coating them in a thin layer of breadcrumbs with an evenly seared exterior. While the breadcrumbs packed in lots of browned flavor, the hazelnut butter was one of the most unusual yet striking accompaniment for the sweetbreads. The mixed greens turned it into a lighter starter -- pretty much a sweetbread salad -- with a very floral and herbaceous overtones. Absolutely loved this dish as it was unlike most sweetbread dishes I've had in the past -- all seemingly always served with mustard. Marcus had the half portion of the chicken-rosemary sausage flatbread with aged gouda, goat cheese, confit tomato, and pine nuts. He found it to be quite good -- really packed in with all kinds of textures melted with cheese. However, given how much bread we started out with, it may have been better to have shared a flatbread instead of singularly eating it. Definitely worth ordering if dining with a larger party! 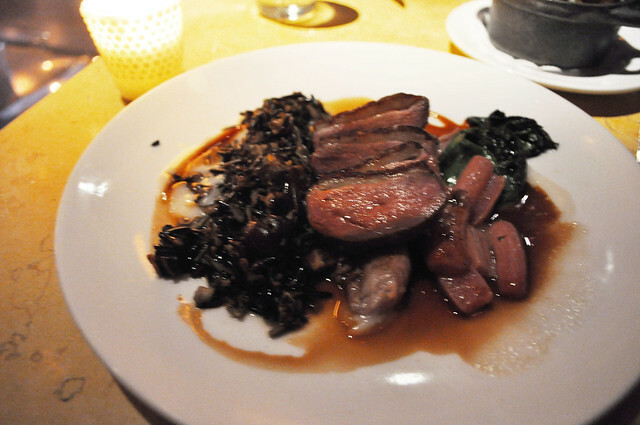 As my main course, I had the honey glazed duck breast with leg confit, wild rice, brandied cherries, radishes, and hazelnuts. 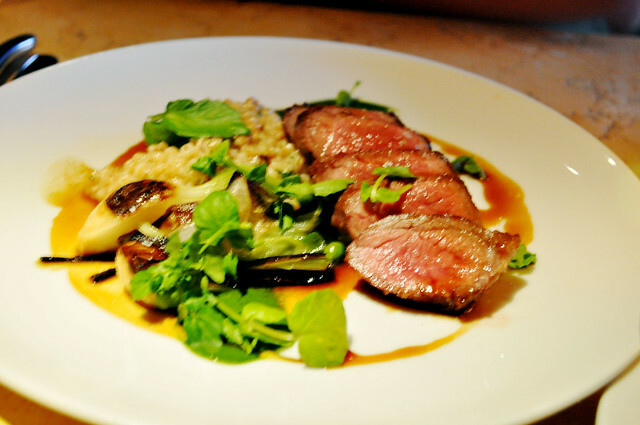 The duck was cooked to a medium rare center, resulting in super tender and juicy slices of meat. The wild rice gave a great textural contrast to the rich brandied cherries and confit. Gotta love me a solid duck dish like this one. Marcus, on the other hand, didn't have good luck with the seared beef ranchero steak with English peas, toasted barley, nettle purée, and spring onions. Perhaps it was this particular cut of ranchero steak -- the meat itself was incredibly tough, even seared to medium rare. Marcus gave it a chance, trying a few medallions before calling it quits, but he was consistently met with really chewy, nearly inedible steak. We let our server know about this -- we really enjoyed everything else we had along with the stellar service -- and she handled it with the utmost poise. We were so full at this point that we just sent it back, not requesting for a replacement dish. Even with this lemon of a dish, it certainly didn't put a damper into our evening -- we'd certainly return back to Birch & Barley without hesitation. 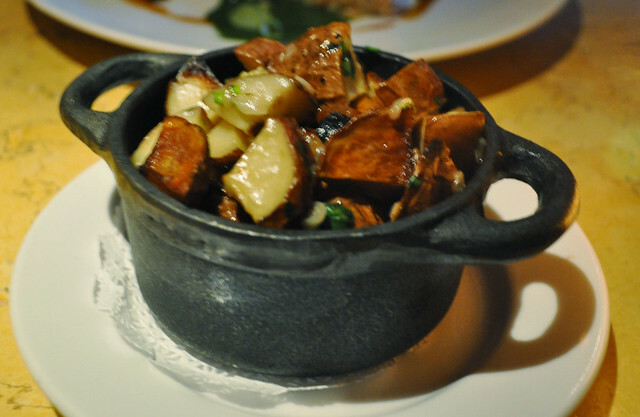 Findings: Marcus and I really enjoyed our dining experience at Birch & Barley. However low-key and relaxed the ambiance was, the quality of fare from Chef Kyle Bailey's kitchen was top-notch and memorable and the service was very welcoming and accommodating. I was quite sad that we were unable to explore the ridiculous beer list (let's face it, it's pretty much a catalogue), but the best part about this kind of predicament is that there's a promise of a next time. With an ever-changing menu such as the one at Birch & Barley, I'm sure the next experience will be an entirely different one completely. 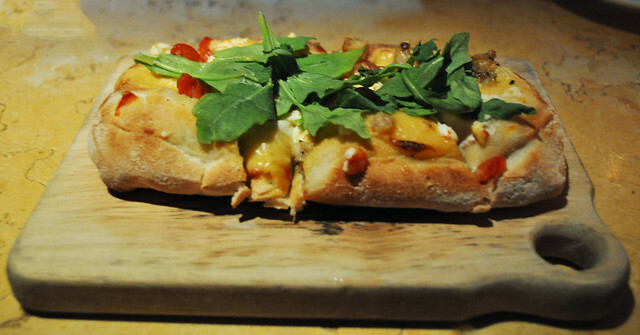 Price point: $14-16 for each starter, $7 for each half-portion flatbread, $25-29 for each entrée. 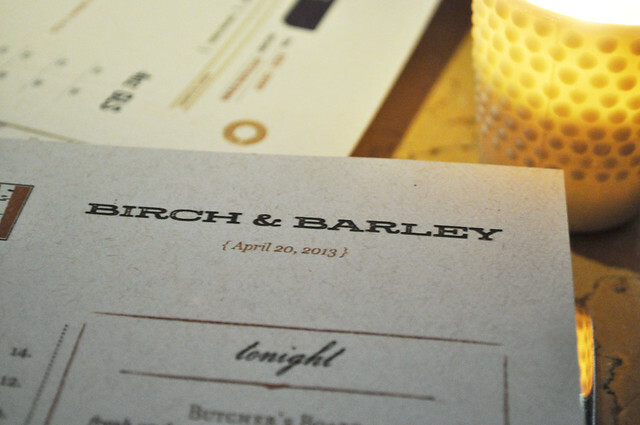 Tags: 2013, American Traditional, Birch + Barley, dining reviews, dinner, first visit, Kyle Bailey, restaurants, two-course, Washington D.C.